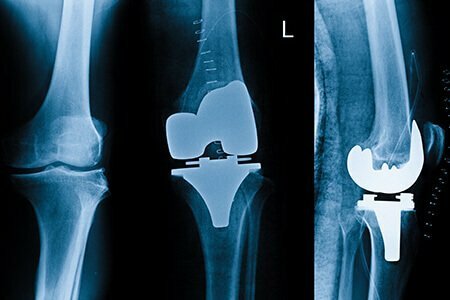 What is Knee replacement surgery, types and implants? What is knee replacement surgery? When is knee replacement advised? Osteoarthritis is an age-related condition which occurs due to the wearing away of the cushion, i.e., the cartilage between the joints of the bones in the knee. In many patients with osteoarthritis and other conditions (rheumatoid arthritis, bone deformities, injuries etc. ), there is extreme knee pain, knee swelling, and inability of movement at the knee joint and knee ligaments. While many patients can be managed with the help of medicines, physical therapy or injections, some do not get any relief with these treatments. In such patients with advanced condition, knee replacement surgery, also called knee arthroplasty, is suggested. In this surgery, weight-bearing portion of the knee joint is replaced by an artificial structure. Today, knee replacement surgery is one of the most common bone surgeries performed around the world. During the knee replacement surgery, the orthopaedic surgeon surgically removes the part of the knee that has been damaged and then this portion is replaced by an artificial joint, commonly known as a prosthesis or an implant. The artificial joint or implant is fixed to the bone of the thigh on one end and the shin, and kneecap on the other. These parts are cemented together with special materials like acrylic or cement. What are the different knee replacement procedures available? 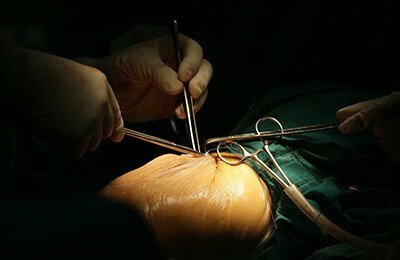 Total knee replacement: Most common type, where the surfaces of the thigh bone and bone of the shin which connects to the knee are removed and replaced with an artificial joint. Partial knee replacement: Performed when arthritis affects only one side of the knee and the ligaments within the knee are strong. Replacement of the kneecap: In this procedure, only the under-surface of the kneecap is removed. Complex (or revision) knee replacement: Usually performed in cases with very severe arthritis or a history of earlier knee replacement surgeries. High flexion knee replacement: The high flex knee replacement is the leading edge treatment for joint replacements. The Flex Fixed Knee replacement can be considered as a total knee replacement advised for osteoarthritis patients. The Flex Fixed Knee replacement is advancement over regular knee replacements as it allows for flexibility of 155 degrees over the regular 125 degrees. How to choose an ideal prosthetic/implant? With advancements in medical science, knee replacement surgery can now be performed in a short duration of time and least invasively. The orthopaedic surgeon can choose from a variety of knee designs or implants depending on the patient’s height, weight, and physical activity level. When the knee replacement surgery was started in the early 1970s, the knee implants were expected to last for around ten years. Now, medical and material advancements, the durable implants can be expected to last for as long as 15-20 years under normal circumstances. Is knee replacement good for me? What are the risks and benefits of knee replacement? It is usually seen that about 90% patients who undergo knee replacement experience much reduced pain. Majority of them are able to perform routine daily activities and stay active. In many cases, patients are even able to resume activities like playing games (such as golf and walking) which they had earlier given up due to painful condition. Deep vein thrombosis or formation of blood clots in the veins of the leg. Sometimes, these clots may become detached and travel to the lungs, thereby, causing a condition called pulmonary embolism. Damage to the nearby ligaments or nerves etc. What can be expected in recovery and rehabilitation after a knee replacement surgery? What factors should be considered while choosing a hospital for knee replacement surgery? The most important consideration while choosing a hospital for knee replacement surgery is the orthopaedic surgeon and his team. The success of surgery depends on the expertise and skills of the surgeon. Specialised training, number of surgeries performed and success rate are indicative of the skill set of your orthopaedic surgeon. Advanced operation theatre facilities including provisions to monitor and control infections like High Efficiency Particulate Air (HEPA) Filters, Total Body Exhaust Suit etc, specialized orthopedic equipment is the operation theatre like C-arm, ‘vacuum mixing’ of the cement, pulse lavage etc. Post-operative care: Trained team of orthopaedic surgeons, anaesthetist, nursing and paramedical staff to ensure a pain free post-operative recovery and after care for physiotherapy, experienced in joint replacement surgery. Round the clock support for diagnostics and pharmacy. What factors govern the cost of knee replacement surgery? To know more about knee replacement surgery, you can request for a call back and our knee replacement specialists will call you and answer all your queries. The older you are, the greater is your risk of osteoporosis. Alerting you to the risk for osteoporosis. Cleveland Clinic. Total Knee Replacement. 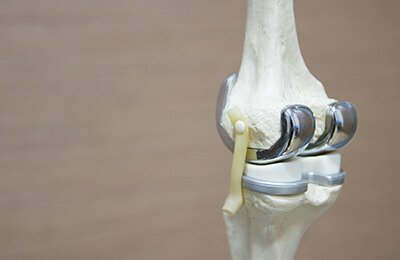 Available at:https://my.clevelandclinic.org/health/articles/total-knee-replacement-surgery Accessed on January 18, 2018. Royal National Hospital, NHS. A Patient’s Guide to Total Knee Replacement. Available at: https://www.rnoh.nhs.uk/sites/default/files/patient/10-85_rnoh_pg_tkr_web.pdf. Accessed on January 18, 2018. American Academy of Orthopedic Surgeons. Total Knee Replacement. Available at:https://orthoinfo.aaos.org/en/treatment/total-knee-replacement. Accessed on January 18, 2018. US National Library of Medicine, Medline Plus. Knee Replacement. Available at: https://medlineplus.gov/kneereplacement.html. Accessed on January 18, 2018.